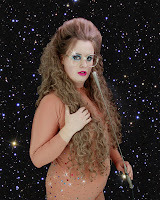 Leslie Hall initally caught the hearts & eyes of America's children when she began posting images of her world famous gem sweater collection on the interweb. Word of mouth quickly grew and within a month Leslie recieved over 2 million unique hits to her website, which left her with a $800 bill for exceeding her bandwidth. In order to raise money to pay back her mother, Leslie did what any 200 lb. plus girl from Iowa would do. She became a rapper. Lesie is a true business women, she sells her art, t-shirts, music and stretch pants with a uniqueness that is very honest. I came across Leslie's info while scanning the internet one day at work on CNN. 's website. It seemed harmless and fun so I dug further into getting to know the world that is Leslie Hall. I must say it is an intersting one, fun, and eventful. She has created a persona that in due time the world will know of and accept as she has accepted her self, plus sized and wearing gold pants!I had the pleasure of interviewing this Iowa native rapper recently via email, hope you all enjoy her uniquness and personality. Remember, we here at UniquelyFat celebrate the plus in everyone and recognize Leslie for her bold style and skillz. Travel? If I'm traveling it usually means my luggage is full of sequin tops and spandex pants... as in hired to perform for the masses. Your uniqueness? Trust me I'm not doing anything that everyone else is not. I just got lucky. LUCKY DUCKY. Why music and the sweaters? The gem sweaters was a honest attempt at making a fan site for thrift store seekers like me. To gaze and appricate the craftsman ship. Totally innocent. The music is the -gimmie attention - don't play the song on the radio play this... and its my voice chanting -- gosh Iwish I could eat a pizza to a homemade beat.